How Do You Solve A Problem Like Fashion Week? The recession is shaking the fashion industry's foundations. Last fall's 85% discounts begat this spring's layoffs. Magazines have folded, labels have shuttered, and consumer spending continues to fall. Anna Wintour thinks this could be solved with a spot of price-fixing. Yesterday morning, the Council of Fashion Designers of America held a private town hall style meeting to discuss the future of fashion week — but the meeting soon mushroomed into a general debate on the serious issues the industry is facing. And nothing is off the table. The entire industry superstructure — how fashion is produced, shown, and sold to the consumer — was hotly debated by everyone from Anna Wintour, to Francisco Costa, to Diane von Furstenberg. CFDA president von Furstenberg made the case for change by drawing attention to the disconnect between the shows — which receive so much press that customers would probably buy items from the collection then and there — and the actual produced goods, which don't reach stores for another six months. By then, the hype may have gone flat — or as Jack McCollough of Proenza Schouler put it, "It's on blogs; magazines pull straight from the runways; and by the time it's in stores, it feels sort of old." Von Furstenberg ventured a solution in a split fashion week: "Maybe there can be a Fashion Week that says trade and another one that says shop?" Other designers have decided that sales are the enemy. Donna Karan fingered early delivery dates — the well-known problem of winter coats arriving in stores in July, which is, if we're talking this so-far dreary summer, about the time you might start thinking about buying a new swimsuit — as a motivator for stores to mark down in-season clothing, hurting margins on the items most likely to actually sell. "The consumer has been trained to buy on sale," said Karan. "Everyone had been too greedy, and everyone thought the party was forever," said von Furstenberg. "We wanted more merchandise, and more of this and more of that, and expect 20 percent increases every month, and at some point it just became too much of everything. I realized that what we all have to do is reduce the offerings and create the demand." Elie Tahari said his company has seen success since it started making smaller, but more numerous, shipments of in-season goods to retailers. "It's about shipping clothes that you can buy and wear right away," said the designer, who compared discounting to "a virus." American Vogue's fashion news and features editor, Sally Singer, laid blame at the inelastic production structure. "There's been an overproduction which has led to the 40 and 60 and 80 percent off. If we produce less, the consumer will have more confidence in the product." 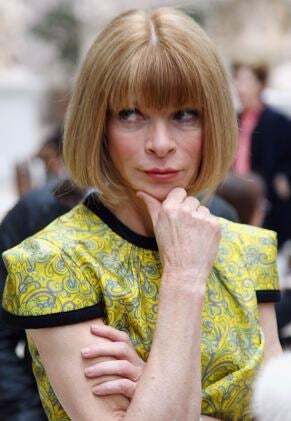 But Anna Wintour's proposed solution really takes the cake. The Vogue editor stood up to offer, "Could someone lead a committee that would make ground rules for retailers of when the discounting starts, and then all the retailers can agree to it?" Von Furstenberg interjected that that was illegal — in fact, if the big department stores had any such agreement, it would amount to price-fixing and collusion, an anti-trust lawsuit in the making. "Is that something we can change?" asked Wintour. "We have friends in the White House now!" Von Furstenberg stressed that none of the proposed ideas will be in effect for the shows this September — she is looking for solutions that can be put in place by September 2010. So which will it be? More frequent deliveries sounds dangerously close to the kind of permanent-new-collection madness that swept us into this mess; some of the big houses already do 12 collections a year. Restricting the volume of clothing produced is a sure-fire way to artificially inflate sell-through rates, but to what end would a successful business actively seek fewer customers when it has enjoyed more in the past? What nobody was apparently willing to address was that fashion became, during the long recent boom, simply too expensive: there are not enough good designers willing to make a beautiful dress that costs not a few thousand dollars but a few hundred dollars. True designer fashion will never be available at Wal-Mart or H&M prices, but why can so few people manage to make a dress that a member of this country's middle-class could actually, in a good month, splurge on and wear with enjoyment? Sales are not the enemy: sales are the message that what designers are doing is not working. And idle talk about lobbying the Obama administration to create loopholes in the nation's competition laws doesn't further anyone's business interests. Betsey Johnson, for her part, supports von Furstenberg's idea of a more consumer-driven fashion week to vacuum up some of the hype away from the trade shows. "I would love to show at Madison Square Garden!" she said. "I wish Fashion Week for the public can be like Christmas, and maybe we'll put up green and pink lights everywhere. I could completely have my showroom open to the public. I could run around that week. I could celebrate in the stores." As the New York Observer notes, her statement was met with silence from the room. A pity — I'd go to Johnson's public show in a heartbeat.